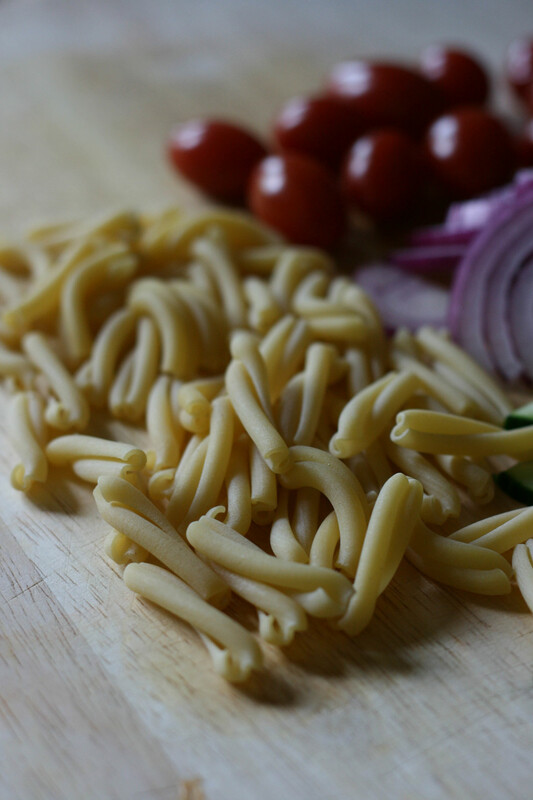 As I am in the process of compiling/writing the post about our move to Dallas, I thought I would drop off this little recipe for probably my favorite pasta salad to date. I am a 'more vinegar the better' type of person, so I tend to solely make/eat pasta salads with a vinaigrette. I know some people (My mom) are not huge fans of pasta salad and only tolerate them, but I promise this one is a game changer! I was literally sitting here a few minutes ago, thinking about what side dish I should serve with our Sweet Tea Brined Chicken for dinner and thought this recipe up. The main inspiration: what I had on hand. That's the best thing about pasta salad...you can throw nearly anything you want in and it is the perfect side dish. On the flip side, if you see a recipe that involves an item you don't prefer, just leave it out. 1. Bring pot of salted water to a boil. Cook Pasta to al dente. Drain. 2. In a medium bowl, add pasta, vegetables and feta cheese. Stir to combine. 3. In a separate small bowl or small jar, combine last 8 ingredients. Shake or stir to blend dressing together. 4. Pour dressing over pasta and vegetables. Toss to combine. Chill or serve immediately.